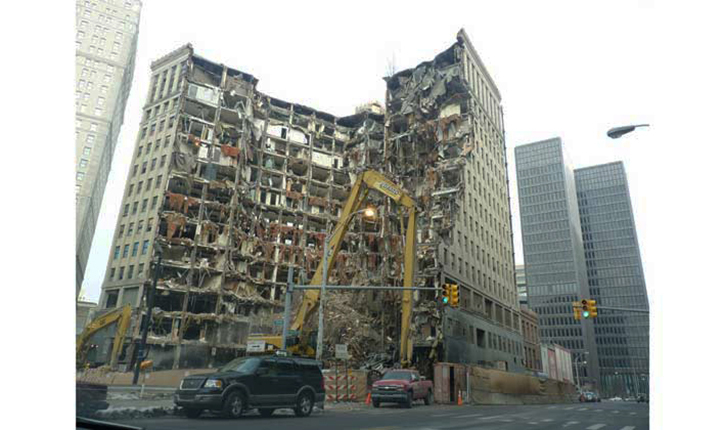 The Lafayette Building was just one of many high-rise office buildings in downtown Detroit, Michigan, to be shuttered in the late 90s as the U.S. auto industry declined. After remaining vacant for more than a decade, it was demolished in 2009. 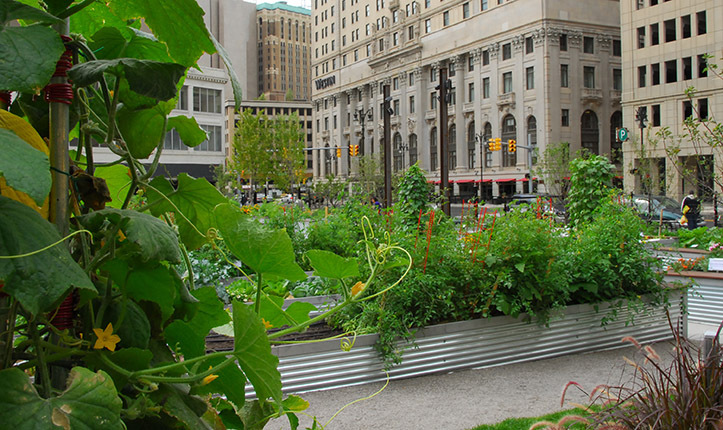 As abandoned space began consuming Detroit -- a city that also suffers from limited access to fresh food -- residents began reclaiming vacant properties for urban agriculture. 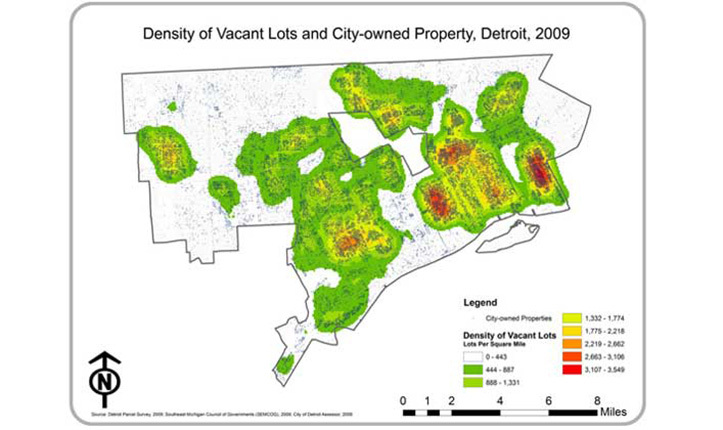 With more than 40,000 vacant properties, Detroit now allows residents to buy abandoned lots for $100 if they agree to transform them into urban farms. 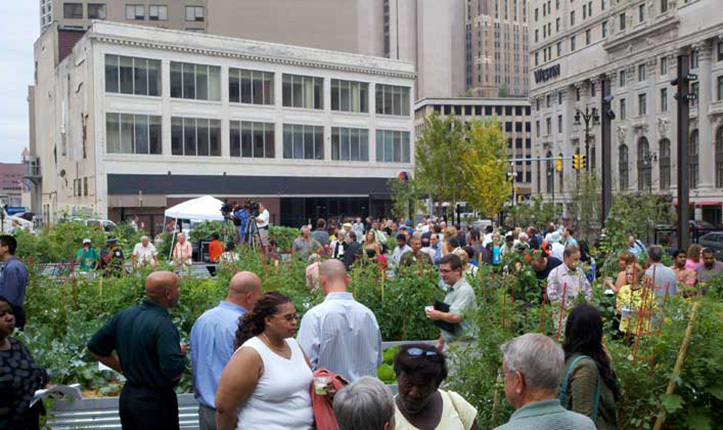 The city now has one of the largest urban agriculture movements in the country. 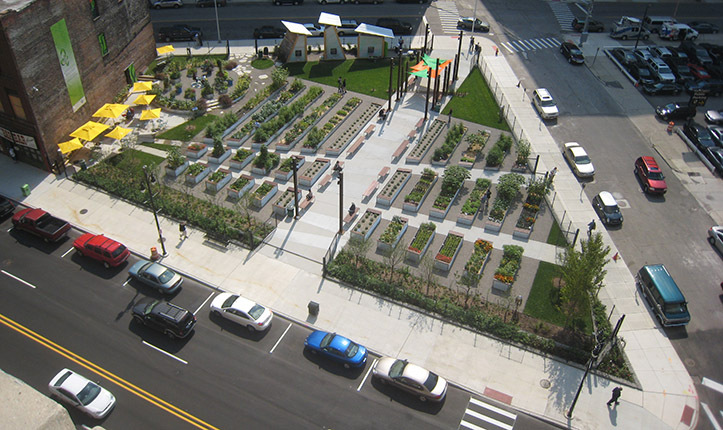 Lafayette Greens is a 0.425-acre garden designed by Kenneth Weikal Landscape Architecture that was established early on in Detroit’s urban agriculture movement. 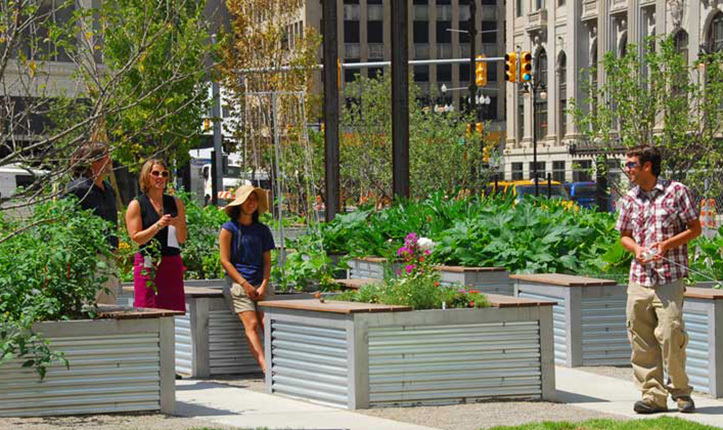 Located on the former site of the Lafayette building, the once-vacant lot is now a garden open to all Detroit residents. The garden, which includes 35 raised garden beds, is tended by volunteers from Compuware Corporation, the company that sponsored the project. Every season, more than 800 pounds of produce grown there is donated to Gleaner’s Community Food Bank, the largest food-providing non-profit organization in Southeastern Michigan, and Freedom House. Raised beds are hooked up to a drip irrigation system. These beds, which are managed organically, are highly productive, with a 200-400 percent increase in caloric production in comparison with conventional gardens. They are also more water and energy efficient than conventional garden beds. More than 200 plants, including vegetables, herbs, flowers, heirloom fruit trees, vines, and berries, were used. Bio-diverse habitat for pollinators like bees and butterflies was added back in the form of short orchard meadow and a bioswale filled with native plant species. 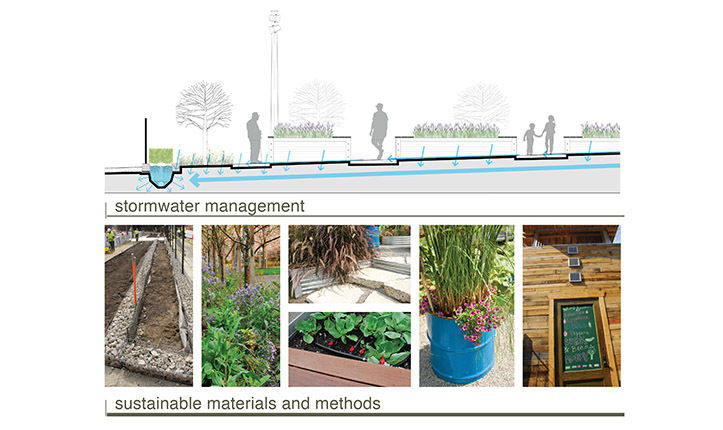 The project manages stormwater with an urban bioswale that has informative signage to raise awareness about water issues in the Great Lakes region. Between two gabion curbs, a Red Twig Dogwood hedge helps keep water off the bordering city street. Water is conserved across the site with drought-tolerant Fescue lawns and a high-efficiency irrigation system with adjustable drip lines. Permeable surfaces, which cover 70 percent of the garden, also prevent excessive stormwater run-off. Recycled materials are used wherever possible. Broken sidewalk pieces from across the city were re-used as pavers in the garden. And garden sheds were constructed from reclaimed pallet wood and salvaged doors. The planters used in the children’s garden were made from repurposed steel drums. 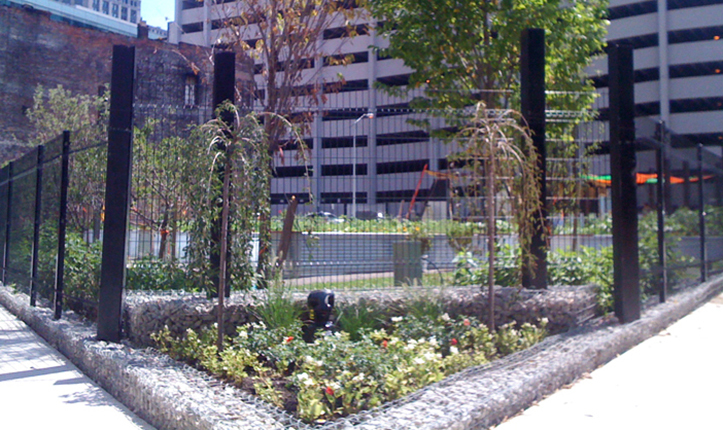 Lafayette Greens is an example of a successful and sustainable public-private partnership. Compuware and the Detroit city government, who owns the land, negotiated a cooperative lease agreement that has resulted in benefits to the public. 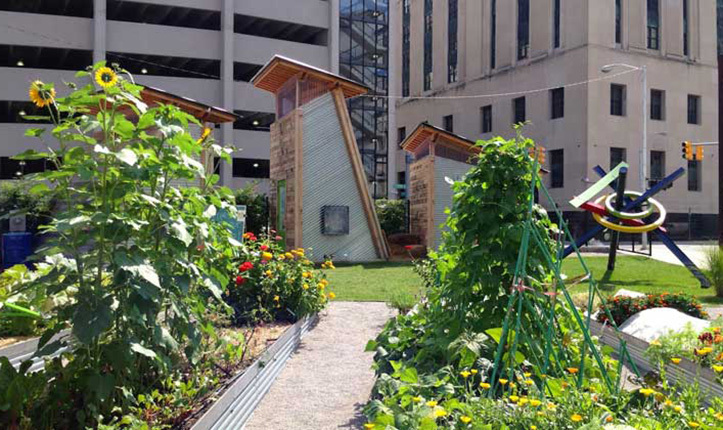 A non-profit, Greening of Detroit, took over the garden in 2014 and now hosts free evening classes. 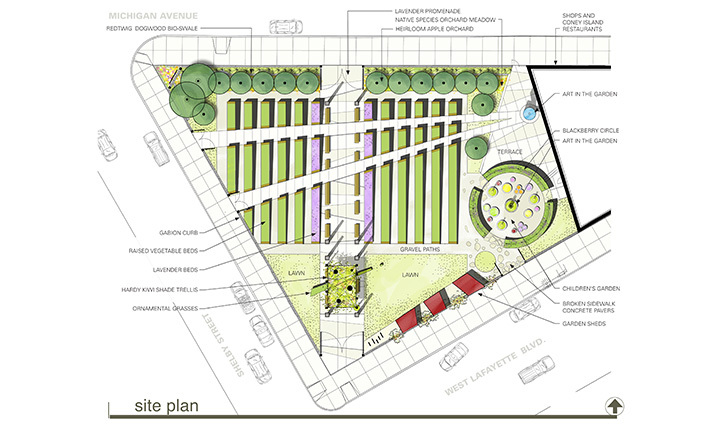 Although Lafayette Green will never produce enough food to feed the entire community, its highly-visible location and smart approach to community outreach has turned it into a valued educational space for discussions about food security and sustainable urban revitalization. 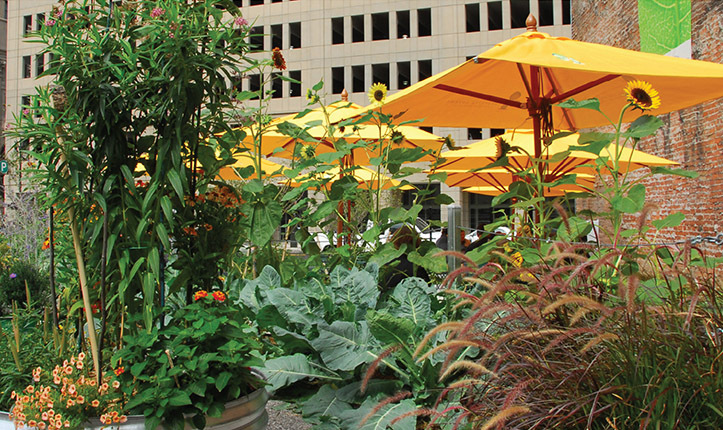 Lafayette Green grows herbs and vegetables in an engaging public space in the heart of Downtown Detroit. More than 800 pounds of produce grown in 35 raised beds is donated to Gleaner’s Community Food Bank and Freedom House. Some 200 plants -- including vegetables, herbs, flowers, heirloom fruit trees, vines, and berries -- add biodiverse habitat for pollinators like bees and butterflies back into the urban environment. Lafayette Green manages stormwater with an urban bioswale while drought tolerant Fescue lawns and a high-efficiency irrigation system with adjustable drip lines conserve water. Broken sidewalk pieces from across the city were re-used as pavers in the garden. Garden sheds were constructed from reclaimed pallet wood and salvaged doors. The planters used in the children’s garden were made from repurposed steel drums. Lafayette Greens also provides an example of a successful and sustainable public-private partnerships. Compuware and the City of Detroit, who owns the land, negotiated a cooperative lease agreement that benefits the public.